Slide show time. Click on a picture to view an enlarged version. 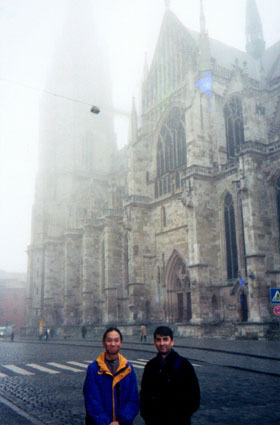 These pictures were taken with various 35mm and APS disposable and budget APS cameras. 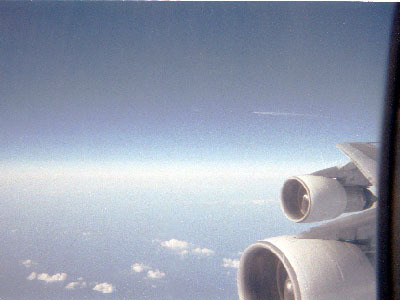 Northwest Airlines 747 over the North Pacific, March, 1999. If you look closely above the #4 engine (far one), you can see the contrails of a United Airlines 747 also heading for Tokyo from Seattle. 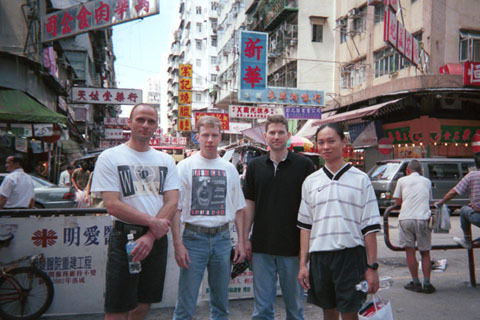 Some members of Team "Conan" at one of Hong Kong's famous shopping districts, May, 1999. L-R: Greg, Gary, Paul, Wayne. Photo copyright Gary Rensberger. 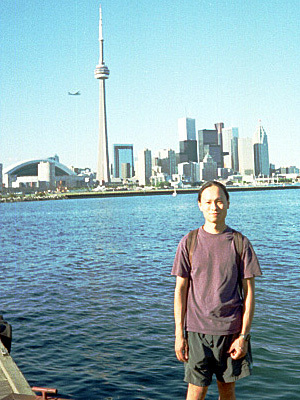 Toronto Island, Toronto, Canada, August, 1999. SkyDome, CN Tower and downtown Toronto in the background. The little airplane to the left of the CN Tower is a Dash 8 taking off from the Toronto Island Airport. 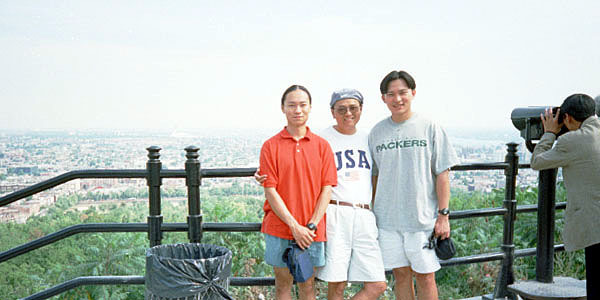 Yours truly, my dad S.K., and my bro Wyman at Mount Royal, Montréal, Canada, September, 1999. Faint outline of Olympic Stadium can be seen in the background. This is the highest point in Montréal, and of course the tour buses don't ever let up.